The 15"x15" clamshell heat press gives you a large area for t-shirt and fabric heat transferring. What's nice about clamshell heat presses is that they can save room over the standard swing arm heat presses, and can be easier to manage depending on the set up of your workspace. NOTE: These 100% cotton shirts are ideal for screen printing and heat transfer. For sublimation printing, check with your ink manufacturer as not all sublimation inks are designed for cotton fabric. 1 Year Warranty - USCutter backs this machine with their full support. BONUSES to get you started right away! 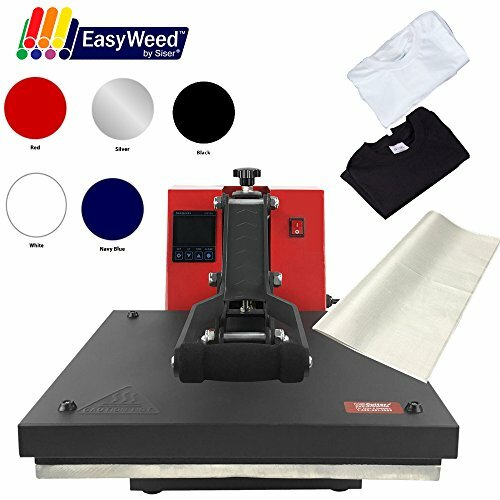 This offer comes with TWO (large) 100% cotton T-shirts (black and white), a 15"x15" replacement Non-Stick sheet, and FIVE (5) Most Popular Colors of SISER EasyWeed Heat Transfer Vinyl 15"x12" (Black, White, Red, Loyal Blue and Silver).